Happy New Year! Now that 2009 is safely behind us it is time to embrace the newness of 2010. 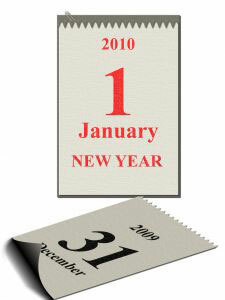 Not only does today mark the start of a new year, but also the start of a new decade. This year, resolve to make a simple resolution. Make it an attainable goal. And don’t stop there. When you reach that goal, make another one, and then another. With each little success you achieve you’ll be motivated to shoot for another. Before you know it, it will be January 1, 2011 and you’ll be down to a goal weight, or will have completely given up soda, or maybe be walking more than driving. If you need a little push in the right direction, try on these simple resolutions for size. And then get ready to make it an entire year of mini-resolutions that add up to one big healthy change! Replace one soda with a glass of water each day. Do a half-decaf, half full-caf blend and slowly wean yourself to full decaf coffee. Wake-up 30 minutes early during the work week. Use that time to read, meditate, eat breakfast, take a walk or simply not feel rushed in the morning. Buy one new fruit and vegetable at the store each week, and actually eat it! Take your lunch to work at least once each week. Eat dinner at the table without TV or other media interference at least one night each week. Pick a spot one mile from your front door and walk there and back most nights of the week. Carve out some “me” time for one hour each week. Pay for, and attend, three sessions with a personal trainer. Take a multi-vitamin each morning. Jog in place or do push-ups during commercials of your favorite TV show. Pace during long phone calls. 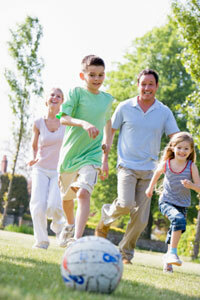 Play outside with your kids for an hour each weekend. Don’t eat while in the car. Swap your favorite ice cream for the sugar-free version. Order a salad at every meal when dining out (dressing on the side). Swap ground turkey for ground beef in one meal a week. Give one loaf of whole grain bread a try. Leave work on time one night each week.